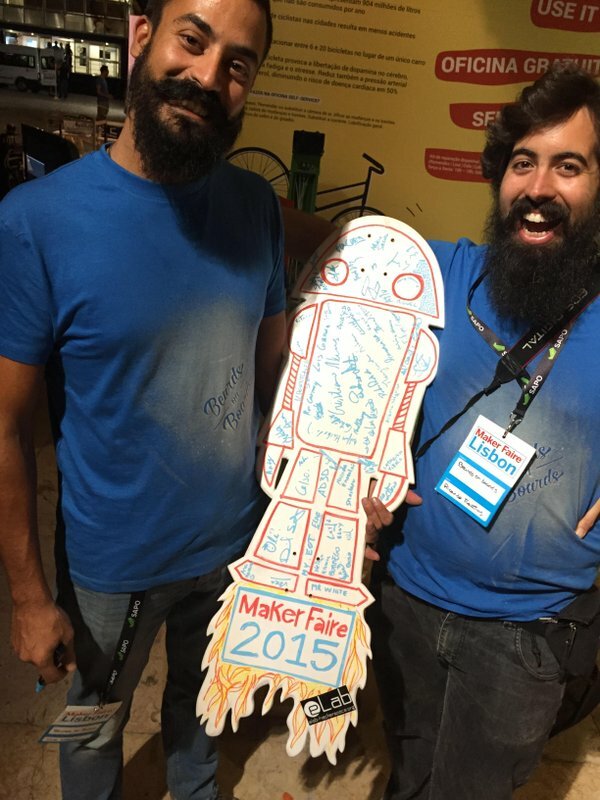 After the huge success that was Lisbon Mini Maker Faire 2014 with over 9000 visitors, here we are again at Maker Faire 2015, which as you’d expect, surpassed all expectations from the previous one with around 14000 visitors. 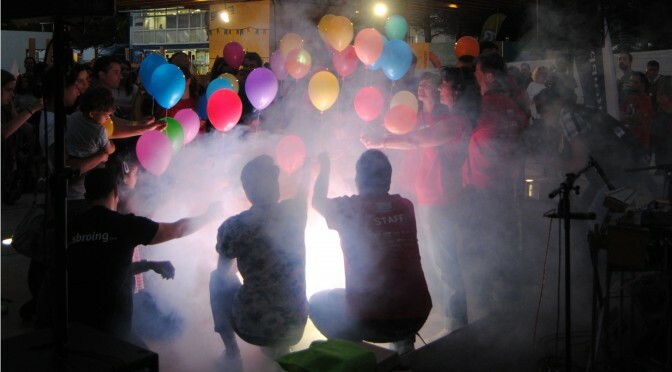 This year there were about 120 projects from different areas, from 3D printing with printers developed by the makers themselves, to robotics, solar powered vehicles, CNC’s, customizable skate boards, a low cost Geodome, an optic intercommunicator, a vintage videogame museum, countless garage projects, etc. Here I’ll do a small summary mainly focused on the projects representing Algarve, which were able to get 1 best in class of science prize and 5 maker of merit awards … Congrats to you all! Primarily built by João Duarte but presented by Dinis Miguel, it was made with low cost materials like PVC pipes and clamps while the connectors were 3D printed. Project sponsored by Grupo Rolear! Maker Mário Saleiro presented some of his projects, among which there was his “i3 Saleiro” 3D printer, based on the Prusa i3 but with some significant improvements, totally designed and developed by him. Also from Mário, a mechanical keyboard that already conquered 3 international prizes, it has several functionalities like saving Macros and reproducing them directly from its hardware, equipped with an internal keylogger, a USB hub, 8GB of internal storage and several illumination modes. And finally, after his CNC THE MAKER 1 and CNC THE MAKER 2, Mário presented his new version, THE MAKER3.1 which shows the evolution from previous versions, capable of milling aluminium and other materials. Thanks to his projects, Mário received a Maker of Merit award, congrats Mário! Maker Fernando Cánovas, one of our members and also from CCMAR showed us a small 3D printer, completely built out of recycled e-waste (CD/DVD and floppy drives) to which he was awarded 2 Maker of Merit medals, congrats Fernando! With this project Fernando warned the community to the importance of recycling e-waste. Fred Zabel presented his version of the low orbit satellite tracking system in real time, SatNOGS, in which the gears for the rotor of the antenna and even its fixation supports were all 3D printed. Ion thrusters are used for interplanetary propulsion on space ships, João Duarte using nails, copper pipes, 3D printed parts designed by him, and a high voltage transformer (9000V), from an old neon sign, developed this amazing engine, which allowed him to accelerate towards the first prize for best in science award at Maker Faire 2015, congrats João! 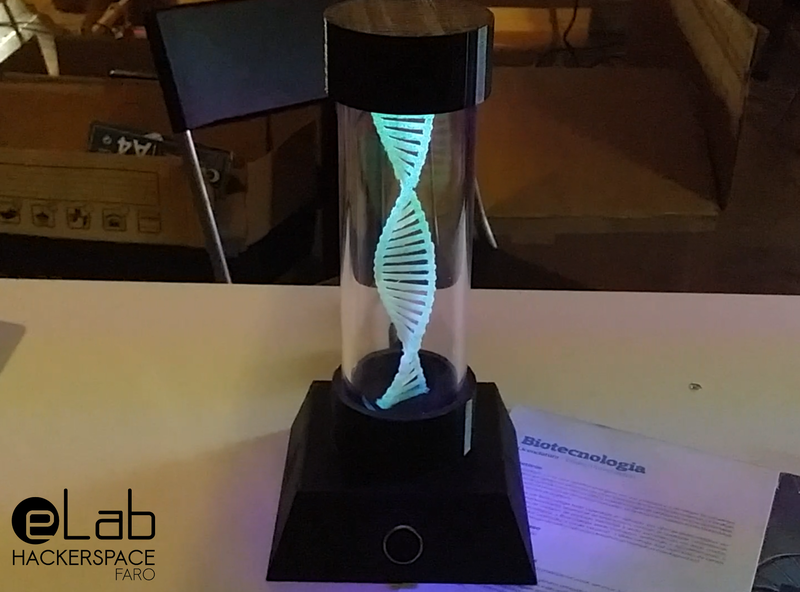 Besides that, João also brought another of his creations, the DNA Lamp, which actually won a prize at instructables and was featured on an article on the prestigious Make Magazine. David Lobato shared with all the Maker community his Nixie Clock built from scratch, which brought a vintage feeling to the event. These displays use plasma discharge on neon tubes to emit light. 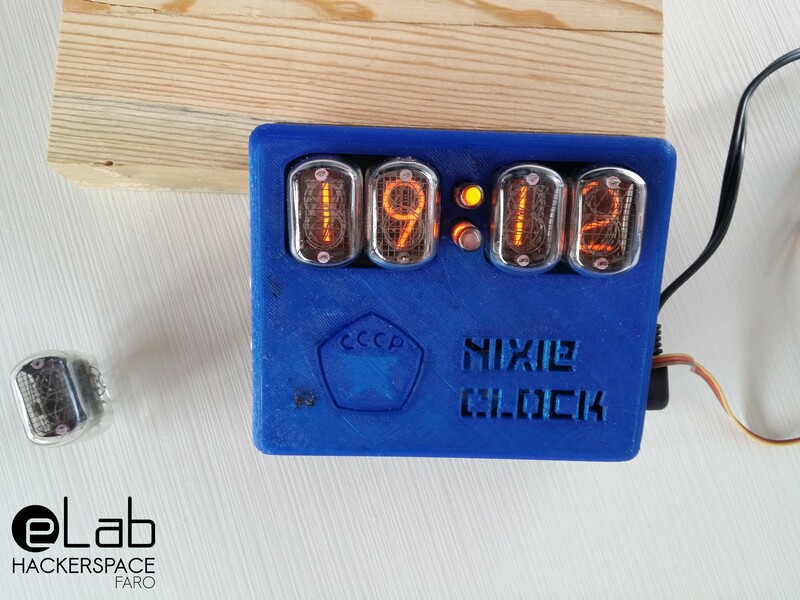 This clock uses high voltage converters to power the nixies and an Arduino nano as the main controller. I had the opportunity to present my small robots, made on my 3D printer that I’ve built. These toys were able to captivate the attention of the younger public on the Maker Faire. Our maker, radio amateur and analogue electronic specialist Emídio, showed the Faire his most recent communication device, an LED transmission system, built and developed by him from scratch. This communication device established communication with the public through a light beam. Luís Carlos presented a project that was a real marathon to finish. He built a real scale replica of himself, which took him over 500 hours of 3D printing using over 10kg of PLA filament. Incredible! Beside that, he also presented his 3D printed Bobble Heads. George Ghiuro, IT student at UAlg, presented his Dagu Rover 5, a robot controlled by Arduino, which goes on a trajectory aside a certain object, using an ultrasound module. Daniel Martins and João Silva, Electrical and Electronics Engineering Students also received a Maker of Merit award, congrats to them which brought a large interactive LED Matrix, on which it was possible to play the famous Snake game, among other things. Also from CCMAR, Maximilian Ritter presented his multispectral camera, which also got him a Maker of Merit medal! Congrats Maximilian! Beards on Boards were also awarded 2 Maker of Merit ribbons. My congratulations on behalf of eLab Hackerspace. They showed us how to make their customizable skate longboards, using painting techniques, sculpting and woodworking that ultimately end up being real awesome works of art. I hadn’t seen for a long time at a Maker event, vintage videogames aficionados.. Me, as a person who lived through the personal computer revolution of the 80’s, ended up feeling nostalgic. There are few who still remember today Atari Amiga, Zx Spectrum, VEGA… or games like Space Invaders, Out Run, Chuckie Egg, Super Mario, etc. Here at Maker Faire there was an opportunity to go back to that era, and there were a lot of volunteers to relive those times, even though many of them weren’t born at that actual time. One of the projects I liked the most to see at Maker Faire this year was presented by the students of the Robotics Club of São Gonçalo School from Torres Vedras. On my behalf and on behalf of eLab Hackerspace our most sincere congratulations! These students presented a great deal of commitment and enthusiasm around the work they developed. It was a project that touched me and the entire Maker Faire. This group of students was already awarded internationally on several occasions in robotic competitions and here it wouldn’t be an exception, they were again awarded with a Prize of Excellency on project presentation and a Merit award, for their work in robotics. On this award they conquered the much desired BQ 3D printer, offered by BQ Portugal! 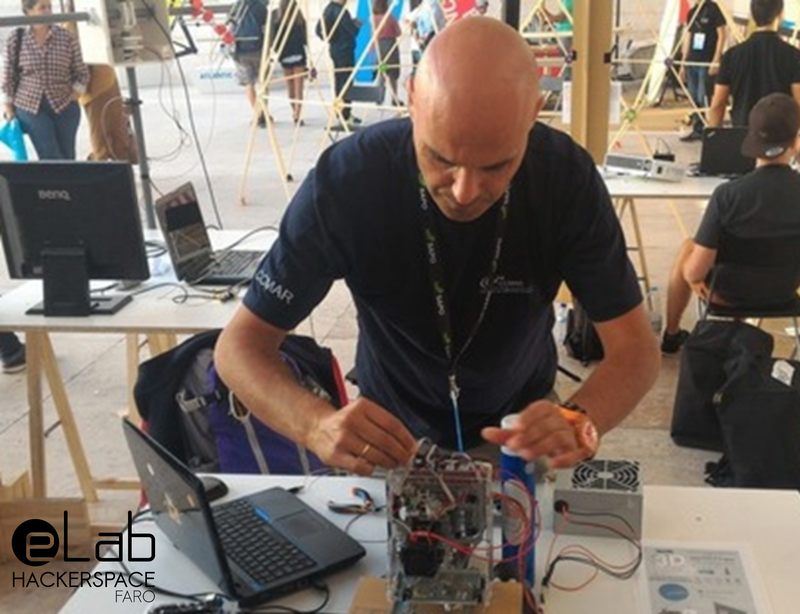 And with this, we close off another excellent participation of eLab and the rest of our Algarve team, at a world renown event that is Maker Faire. This year our Algarve team represented about 25% of the projects presented at the event, and conquered 5 Maker of Merit blue ribbons and the first Best in Class of Science red ribbon! See you next year … For there is more to come ….